The map of the month is more of a competition more than a club really. Anyone can participate and it's really easy to do. Where you the community will choose the winner! Each month, anyone wanting to participate can create a map for submission to the co-oridinator for that month. Then at the end of the submission period, the co-oridinator will put all of the maps received into a mapset to be released/downloaded by anyone wishing to play them. At the same time, the co-ordinator will create a Poll in the Polling Section of the forums where anyone that has played the maps can vote for 3 of their favorites. Then when the poll expires, you all will have chosen the best map for that period of time and the co-ordinator will post the names of the people who made each map so you can see how you all did and who won by your votes. Are there any special rules in making maps? The only real rule is that you can't use the secret elevator floor on your map for the elevator itself. There are no secret floors or levels in this game. Other than that, you can use any enemy (including Bosses) as the bosses have all been set to drop a key rather than end the game as the original game did. The other thing that you can't use is the "End of Game" trigger.... Always use an elevator to end your level. Each new level will start as if it was the first level in the game. By that I mean that you will start with 100% health, 8 ammo and the pistol. This is done so that all levels will have the same feel and play as far as starting with weapons. Also, that way one level will not be easier because of something gained in a previous level. My answer is why not?? It's something easy to do... Only takes 1 map from each person who wants to participate (and who can't easily make 1 map per month). And by doing this, it will give us all something new to try... something new to play.. each month.. It just might help people build mapping skills and actually be something fun that everyone can play each month. In doing so, it also keeps the spirit of wolfenstein and our community alive and well. It's also something that you can be proud of. If you win.. or loose.. it's just something fun to do. Making one map doesn't take a long time and as such, it won't put any pressure on anyone as it's your choice to participate or not. You create your map using whatever mapeditor that you wish to use. You should test your map to make sure that it is completable and that all ratios (secrets, treasures, and kills) can be achieved.. And then you Export or Save the level as just the level using whatever mapeditor you use and attach that in an e-mail to my listed e-mail in the forums. There is no need to zip or archive it, unless you can't send attachments without them being archived. NOTE: In the E-Mail, please include Your Nickname on the forums, the name/version of the Map Editor that you uses, and the Name for your Map (if you didn't give it a name when you created it). Do I need anything special to make a map?? No - not really. You can make your map with any of the mapeditors that are available and all it really takes is a little imagination. There is no storyline to follow so you can really do anything you want with your level. You can make it a shoot'em up, a free for all.. a maze... a puzzle... anything... it's all up to you and your imagination. We just ask that you use the original game design specs (as there is nothing special added feature wise for you to include in your map at this time). Can I give my map a name?? So how do I control things like Ceiling/Floor Colour etc?? The EXE (which can be downloaded by clicking this link) that I have created for this allows you to control the ceiling and floor colours, as well as the song being played for your level, the par time for your level, and if you want to use it as well - the starysky and rain/snow. Using the map editor, you place wall tiles in specific spots on the TOP row of the map to control these things for your map. Mapspot  = Controls the Song being played. If you want song 3 to play for your level, you place Wall 3 on that spot on the map. Want song 14 to play.. place wall 14 there. Mapspot  = Controls the Ceiling Colour. You have 254 colours to choose from in the wolfenstein palette. Now, I know there are not 254 walls in your mapeditor definition file, but I am sure that you can pick the correct colour that you want and if needed add that value to your map editor so you can select it. Mapspot  = Controls the Floor Colour. In the original game, the floor colour was always gray (0x19 in hex which is 25 in decimal) so if you want the same floor colour as the original you would put wall value 25 in this spot on the map. Otherwise, pick the colour you want and do as you did for the ceiling instructions. Mapspot  = Controls the Ceiling and the Starry Sky. If you want the Starry Sky.. place wall value 1 in this spot. if you don't want the starry sky... place wall value 0 or blank in that space. Mapspot  = Controls the Rain/Snow. A value of 2 will turn on the Rain. A value of 3 will turn on the snow. Any other value will do Nothing. Mapspot  = Turn off Shading if this value is 0. Mapspot  = Turn off Crosshair if this value is 0. [ NOTE: ] For spaces 6 and 7 - They start your map with these items off, But the user/player may still turn them back on, so I would still set the settings shown below. To set the Par Time for your map you use two more mapspots to set the time that you wish. So if you wanted your par time to be 2 minutes and 45 seconds you would place wall tile 2 on spot  and you would place wall tile 3 on spot . And he used 3 different values for those settings.. 0, 10, & 15. Now you can play with them as you like to get the specific look that you want. One thing to remember though is that depending on the age and type of your monitor, the colours that you see may be different to someone elses machine. So play with them carefully. Mapspot  = Colour of the Crosshair 0 to 15 are usual values but again, you can use any colour from the wolfenstein palette. Note: For those that previously downloaded the new exe, you will have to again as I took out all the little bugs that quickly creating the others created.The new exe also now includes the TAB-W so you can warp to a specific map to start. The other thing to remember when placing wall tiles is that the "Invalid" value or "Blank" is actually the value "0" (zero). How long will this run or continue?? When I run the NEW exe what are the controls?? Tab-W Warp to Whatever Level? What are the features of the new EXE?? As you can see from above, we have shading, ratio monitoring, weapon crosshair & bobbling, Ingame messages, Onscreen timer, along with Map Control of the Ceiling/Floor colours, Starry Sky, Moon Colour, rain/snow, and Par Times. Enemies can push Pushwalls & the Player will get credit if the enemies find hidden areas. Pushwalls will kill the player or enemy, if they are standing where the pushwall is sliding into. You only have the Weapons that you have picked up. aka Bestweapon! There is only 1 ammo type for all weapons. Small fixes to the AI controlling enemy movement. These may or may not change an enemies behaviour that will be noticable all the time. But be aware that it does change the directions that they scan - and if you play one of the original maps you may find that you may not meet alerted gaurds in the same place you always did. You will hear a heartbeat that increases in speed when the players health drops below 75% - when it gets real fast... you need to find some health. (-) & (+) keys will decrease/increase the screen size. The annoying sound is gone when bumping into walls. It still makes the sound when you push on walls. If the shading is toggled on - the enemies will light up in the distance when shooting (basically you see their weapon flash as they shoot). When you change weapons the weapons actually change. Each level will start as if it was the First Level in the game. That means there is no advantage to any weapons or ammo gained on the previous levels - or extra men for that matter. If you use a boss on your level (any boss) they will NOT end the game. They will drop the yellow or Gold key, but they will not end the game. Secret Elevator floor will NOT take anyone to a secret level because there are no secrets. Random Blood splats will come from the enemies when you shoot them. They are very random and will not appear ever time you hit them. All Bugs from the Code Crackers bug thread have been removed. And just so there are no other questions like version and such... This is it's own version as you will see from the signon Screen.. 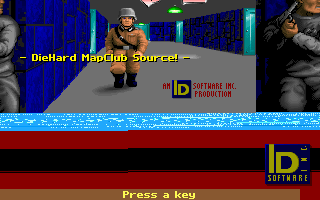 It's the DH (DieHard) Software version and runs with the full version files for Wolfenstein 3d. The new exe was compiled on May 28, 2007 - so if you don't have that date... you need the new one. If you find any problems with the EXE please Private Message (PM) Me so that I can take care of any problems before the maps are released to the public along with the same exe. People wanting to play and vote on the levels in the game will need the files from the Full version of Wolfentein 3d and will just copy these files over copies of those files. From now May 29, 2007 until June 30th, 2007, I will be accepting maps from any and all people willing to participate for this period. There are 60 Map slots Open.. so don't be shy. Those wishing to participate... It's 1 map per month... Nothing special.. And we'll see if we can't maybe come up with some kind of award of some kind... (even graphic - who knows) or maybe they will want to be the co-ordinator of the next session and so on.... Anyhow, I've already got my map ready... (Yes, I will enter a Map but I will not vote). I don't know if it's caused by my wrong handling or an error, but it appears impossible to turn off that. Not only this, I've been manipulating with mapspots from 0,1 to 0,4 in many ways, but to no effect. It would all still stay the same. What might be wrong? It seems impossible to turn what off? The shading? Use "TAB & S" Keys at the same time. The 0,1 to 0,4 do work for setting the shading values. I just tested that exe here again... and it definitely changes the way that the shading works and the way the colours fade. What are you trying to achieve? Actual Fog? If so... try using higher wall numbers like 25 + for the first 3 spaces and of course... 1 for the fog flag... All I did was take Ripper's tutorial and instead of it getting or setting the shade table via the "select (gamestate.mapon etc..) where he has 3 definite settings with the values being 0, 10, and 15... (In the wl_play.c) file... and told the program to get those values from the map instead... so... you might have to play with the values to get the look you are looking for. All right... I messed up a bit (namely, confused fog with shading and missed this tab+s combination... but never mind now). Anyway, everything is right now. Thank you. I've downloaded it and got it working. It's a pleasure to work with! This project sounds like fun, can't wait till June 30th! Heh, I finished my map for the contest earlier today. I figured if the contest didn't pull through, I'd have something for my TC as an alternative. I should name the map though, so I think I'll do that. And now that I have a full list of the map setting features and how to use them, I can fine-tune the level's features more to my liking. Should get all the work with it done by tomorrow night. Anyone know how to change the color of the shadow in the "Time" font? It seems I'm stuck with Light Grey, even though the color is different in other maps. MCS has pointed out a few little mistakes - in the MLI cheat... which I have now fixed, but he also asked if anyone needed the debug keys to debug their maps? Let me know, and if so, I'll enable those as well with a new password of course and then I will upload the fixed EXE (the problem he found is that if you press MLI it shows that it gives you the keys, but they didn't work or allow you to open the locked doors for some reason... strangely enough it was something else that I overlooked in the MLI code, as I store more than the keys in 1 variable now... ). BackSpace-D = Kill everything on Level - To Calculate Total Score for a level. The Links Above have all been updated with the latest file fix!! So if you haven't got the latest Time/Datestamp 05-28-07 11:53pm then you need to download the file again. I must say that this is really cool. Thanks Lozer_42 and everyone participating.. I hope you all enjoy it. I know the thought when I came up with this made me happy and smile. Anyhow... I've already received received a couple of maps (yes Serpens yours was one of them). There is no rush. The mapping period is for the month of June. So we still have a ways to go (as it's still May lol...). I really didn't think people would be this fast with the maps. The only reason that I have one done myself is that I was doing it to test the features of the exe as I went along (I've been working on the idea for about 2 weeks myself - The idea came to me while I was really sick, if that means anything lol). Anyhow... I'm sure that everyone is looking forward to not only playing your maps but voting as well. And with the interest and excitement that you've all shown so far, I can see this continuing for a long time to come. (yes Serpens yours was one of them). Heh, thanks for letting me know and sorry again for bothering you. I must have missread something earlier; I downloaded the link above. Sorry, my mistake. I misread something in the documentation and was changing the wrong wall in the map. Everything is 100% functional now. Expect a map shortly. And no, I didn't rush this map. It just got finished sooner since I had more free time than usual, and I also had to stick to the 400 Static Objects limit without Ammo Boxes, so I couldn't quite make the big maps I'm usually able to. Something weird, though; Isn't Grey Stone 2 supposed to give you 30 seconds added to your par time? I keep getting 15 for some reason, as if the Grey Stone 1 wall was there instead. Haven't tried the newest EXE, though. I'll also try to track down when that Pistol 2 Bug shows up and when it doesn't. I'll let you know if I figure it out. At any rate, thanks for adding the Static Objects report to the Debug messages. I always found that part helpful. If possible could you add one thing. have space , decide if shading will or will not be on the map. I know that you can use TAB+S in game but I think this might be better. ...Because what if you don't want shading? I personally would like to not have to press TAB+S every time it changes. Could you post a screenshot to show us what's "messed up"? My files worked fine, so I could send you whatever files you need to replace. If it's simply the images displayed from VGAGRAPH, most images won't be garbled; they'll just be using images other than the ones that are supposed to be displayed, and all the wrong size; BJ pics will be used instead of a gun pointer, photos will be used instead of numbers ... things like that. Anyhow... you just have to love that Apogee added 1 graphic in their vgagraph file... the added picture for Spear of Destiny... Which is not in any of the other versions... so it's 1 graphic that throws the whole thing off. Sorry it took so long... lol.. The problem that you have is that it's version 1.1 or 1.2. Those versions don't have the Ad for Spear and they don't have the Joystick Calibration. I've built that exe as well.. and put it in the download file. Simple. Spear of Destiny was being sold by Apogee, while the second-hand vendors carrying the Wolf3D title didn't sell SOD at all. The logical theory of it really is that ID was developing SOD and with the initial setup where ID released Wolf3d shareware and one could buy the original full version via Apogee (as they had the accounting and distribution initially). I think when the initial contract with Apogee ran out, others wanted in on the action and they probably had a feeding frenzy for the distribution rights, with GT eventually winning out. When GT went under, Activision and then Id itself took on the distribution. It would have only been logical to advertise the game within the game.. and once released, it would no longer need the plug per say... The only two versions with the ad were releases before the initial distribution contract ran out (hence 1.1 and 1.2 versions were Apogee Specific).